The best business blogs are constantly finding new ways to tweak their blog posts and ensure that they are presenting content in fresh new ways. There are hundreds of tips, guides, and tricks to help you create a great business blog. 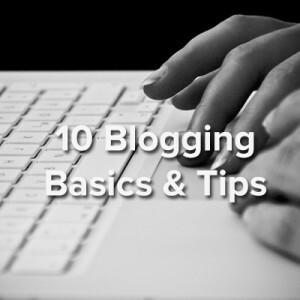 Regardless of the subtle intricacies that help you differentiate your blog, here are ten fundamental principles and blogging basics that every great business blog is built on. The beauty of the Internet is its accessibility. Information can be distributed and consumed freely. The difficulty lies in the ubiquity of information. With so many sources available, it can be difficult to get your voice heard. Titles remain the number one attraction to drawing people’s attention. Creating compelling blog titles is the engine that drives traffic to your site. Produce worthwhile content. Your content proves your commitment to excellence. By demonstrating your ability to translate complex industry concepts and deliver them to your visitors in a way that is easy to understand you show that you are a company that is worth working with. Tangents are tempting. During the process of writing you can depart from your main topic without even realizing it. When you notice this happening, take that material and use it as the inspiration for another blog post. Each post should only tackle one concept at a time. By concentrating on one topic per post, your visitors will be able to leave with a solid grasp of the material. Your experiences and dynamic bestow your company with a unique story. Don’t try to be something else. Stay true to your company’s identity and you’ll reap the benefits in the long-run. Customers who came to trust you through your blog will become delighted through your service and become your best advocates. Set a schedule and stick to it. By producing blog posts on a regular basis at a consistent time shows your visitors that you are reliable. Sporadic posting practices will do little to inspire confidence in your ability. Presentation is just as important as content. Use pictures and keep your sentences short. Stay away from long blocks of text. By making your content visually appealing you increase the likelihood of people receiving the message. Your blog posts should have a natural flow or progression that guides your visitor from point to point. Start with the most important information first because that is what your visitors are most interested in, then finish with a definitive, action-oriented conclusion. Every blog post should include a CTA (call-to-action) that presents your visitor with the opportunity to take their education one step further. By providing an actionable next step you won’t leave your visitors wondering where they should go. Don’t succumb to the pressure or burden of being the lone voice of authority. If you find an article helpful or know of an article that elaborates on a topic you briefly mention in your article, provide a link in your blog post. The goal of your business blog is to be helpful and directing your visitors to great content is a great way to further that goal. Promote your blog posts via social media. If you’re going to devote the time to craft valuable content you should spend a little time to promote your posts and make sure it gets seen. By mastering social media you can increase the amount of people that receive the benefit of your blog. There are many more tips, techniques, and blogging basics you can apply to improve your business blog. Here are a few more resources that you might find helpful to get you started, including our free B2B Marketing Checklist that shows how blogging fits best into your overall marketing strategy.